In a rare display of bravery, former National Chairman of Mega Progressive Peoples Party (MPPP), Hon. Aderemi Banjo, Wednesday, formally declared his intention to represent Surulere Constituency 1 in the House of Representatives. “History has offered us another opportunity to redefine our future in a direction that would strengthen the bond of unity, empower the people and develop the constituency. My mission is to offer service. I have the vision and moral fortitude to represent Surulere Constituency 01. I have a duty to make Surulere Constituency 01 better than it is today. I hereby declare my intention to seek the nomination of my great party, the All Progressives Congress (APC) for the office of member, House of Representatives, Surulere Constituency 01. I am not power-hungry. I urge you with humility and sincerity to give me your support and prayers to realize this aspiration” he said. Banjo, who is eyeing the Surulere Constituency 1 seat on the platform of the All Progressives Congress (APC), criticized the member representing the constituency, Hon Femi Gbajabiamila, urging the people to reject the 5thterm agenda. He posed the questions;what, then lies our salvation? Does it lie with the 5th term agenda? No. Does it lie with continuity? No. Does it lie with hooliganism? No. Does it lie with divisional caucuses or self-enrichment at the expense of the suffering masses? No. Our salvation must necessarily flow from a collective rejection of the 5th term agenda. Our salvation must flow from genuine programmes and dividends of democracy. Our salvation must flow from our collective rejection of politics of bitterness, prejudice and greed” he said.. The aspirant addressed a huge crowd of APC faithful in Lagos at The Leader Speaks, a top-level progrmme for politicians, industrialists and technocrats. Banjo stressed that Gbajabiamila was unmindful of the interests of the masses. “Has the incumbent lived up to expectation? Does the incumbent deserve our mandate for another four years? Are the youths jobless? Are people tired of the four-term incumbent? While maintaining that Surulere Constituency 1 needs a representative who can be trusted with power based on his antecedents, Banjo urged the people to see his aspiration as a service to the area. Banjo explained that the financial strength of the Majority Leader was a non-issue, stressing that he has all it takes to defeat Gbajabiamila in the primaries. “Situation makes it difficult for many to be in opposition. Today, we oppose division, inequality and returning of a poorly performed lawmaker to the House of Representatives. The compatriots have risen: victory is certain”. 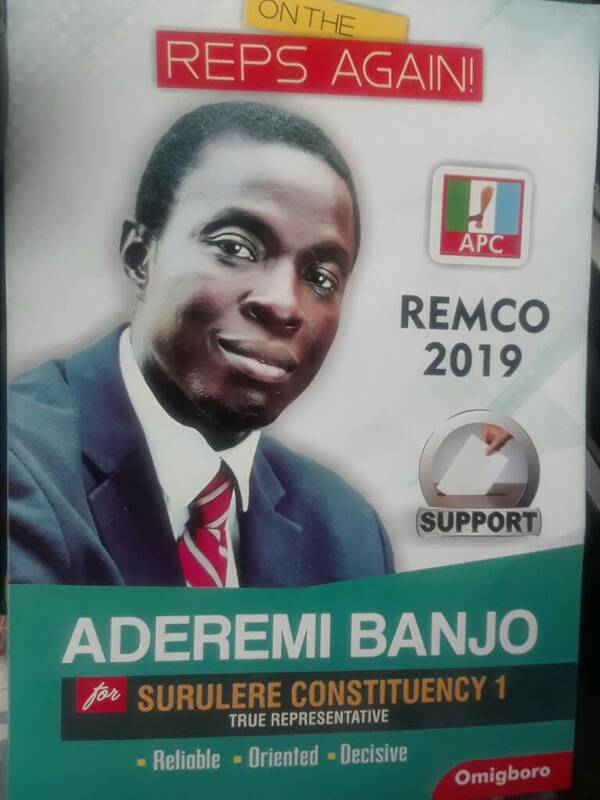 Echoing what appeared to be recipe for development of the constituency, Banjo promised toput a new song in the mouths of the good people of Surulere Constituency 1. Banjo said he would bring positive changes to the lives of the people. “Constituency project has to do with development. I will make a huge difference” he said. He praised APC National Leader, Asiwaju Bola Ahmed Tinubu for his role in nation building, firm foundation for sustainable democracy in our polity and commitment to the success of many Nigerians. “I must commend the state chairman of our party, Mr. Tunde Balogun, our senatorial leader, Chief Oluyole Olusi and Chief D O Adenekan for joining our national leader to put democracy on a firmer footing in Nigeria. I commend Senator Oluremi Tinubu for her sparking records of excellent achievements in the Senate. I salute Governor Akinwumi Ambode for his development oriented leadership and prudent management of resources” he said. Banjo, a trustworthy politician and a man in his 40’s, started his education at the then Federal Demonstration School now known as Onitoro Primary School. He proceeded to Onitolo Secondary School in Surulere and the University of Benin, Benin City. Before his sojourn in politics, Banjo worked with Evans Pharmaceutical, Agbara Industrial Estate, B. Bily Enterprises Limited, Lagos, Nickeron Nigeria Limited and Keind Ifeja Limited, Benin City. A graduate of Biochemistry and Public Administration, Banjo was youth leader and delegate, Surulere Ward G3 in the days of the National Republican Convention (NRC), Secretary, Mega Progressive Peoples party, Lagos State, member, steering committee of MPPP in the South-West, Member, Merger Committee, Mega Summit Movement and National Democratic Movement (NDM) and first National Chairman of Mega Progressive Peoples Party. .Presently, he is a member of the Joint Surulere Leaders Forum, Lagos State APC Leaders Forum and chief executive officer of a property management and consulting company in Lagos. “Let us offer the electorate something better. Let us join hands to make Surulere great again. Let us support someone who is not only familiar with the problems facing Surulere Constituency 01 but ready to find solutions to these problems” he added.